It looks as though it is a good year for roses as they are everywhere - and they are gorgeous! So I thought I might run a series of pictures of roses on my Pagan Eye posts. Earlier this month I posted a picture of a lovely red rose I picked from my garden and here is a dog rose growing in a garden just down the road from my house. 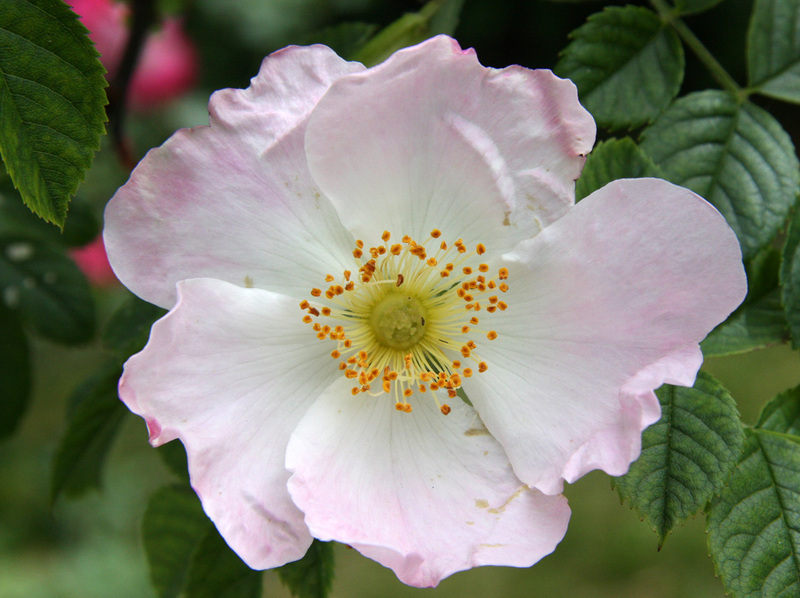 The dog rose is a climbing variety that has a simple, pale pink bloom, which was the basis for the stylised rose of medieval European heraldry. The origins and meaning of its name are unclear - although in the 18th century dog roses were used to treat the bites of rabid dogs. I can't imagine it was a very successful remedy. Another name for the dog rose is witches' briar. Symbolically, all roses represent love, but Margaret Pickston in her book Language of Flowers says the dog rose symbolises love's pleasures and pain. It has lovely flowers, but very sharp, barbed thorns with which it clings to walls and fences - and which can easily draw blood if you try to pick them. These are the rose briars I imagine growing around Sleeping Beauty's fairytale castle - beautiful, but dangerous. You can find out more about the bookLanguage of Flowers on Amazon.